This was the Fiery Runes Series created by Holyknight3000 by using the Diablo 2 runes. For more information, check out Behind the Fiery Runes. 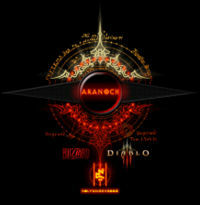 The Fiery Runes Series was created by Holyknight3000 two weeks after the Diablo 3 announcement at the WWI 2008. 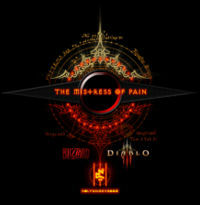 This series was the talk of the d3 community along with Delowyn’s awesome 3d artwork. 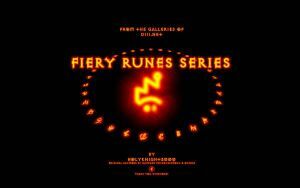 There were to recent memory at least 5 series for the Fiery Runes Series. The staple, and standard for what the series started out to be and the very beginning for this memorable fan art wallpaper series. The sequel and upgrade from series one. This series had a new nameplate as well as bar graphics, and other new additions to create the next step in this series. This series was considered the masterpiece series for Holyknight3000. The best nameplate to date was created after days of work. Adding his own free handed, and from scratch touches to the new nameplate. This series also had new bar artwork the new locations that were added to the series. This series HK had originally planned to have a theme about traveling around Sanctuary. But at the last moment he remade the nameplate and took out any theme to this series so he could just start fresh. With this series he also dimmed the runes down to a red and crimson. He also had revamped the nameplate to be small and compact again. He called this nameplate Baal 2. Also another change for this series was the 5 new runes in the rune-circle from Diablo III. HK had debated whether or not to change the standard circle that had been around for so many years. But in the end he did and thought it fit well. This series went through multiple changes until the new nameplate was made for the latest image. This series was originally planned as the side series to the first and second series, until HK decided to streamline it into a series all its own. These were the extra pieces; the revisited artwork that HK thought was worth making larger, newer, and more improved work to an already existing piece in his artwork galleries. This page was last edited on 5 May 2012, at 14:01.